As health and eco-conscious consumers are increasingly making greener decisions, especially on what they put into their bodies, Green Tiffin—a sustainable food business with lofty values “to honor your body and respect the earth”—is striking a chord with this growing group of the San Francisco population. Green Tiffin offers meal subscription to tasty and healthy plant-based lunches, packed in reusable tiffin boxes and delivered on eco-friendly electric bicycles. Following a well-received launch in April 2015, Green Tiffin is expanding to the Mission and Hayes Valley areas in addition to the downtown Financial District, SoMa and Mission Bay areas it currently serves. In response to the lack of wholesome lunch delivery offerings and busy work schedules that often lead to grab-n-go lunches that aren't the best options, the company’s goal is to make it easier to eat healthy. In addition to delivering meals to offices on electric bicycles, Green Tiffin will start offering pick-up delivery in December 2015. With pick-up service, customers meet delivery riders (known as tiffinwallas) at strategic locations around the city to pick up their meals. “In addition to savings on delivery fee, we are responding to our customers’ requests to leave their offices during lunch – be it for a stretch or some fresh air, we support healthy habits,” Adrian states. Tiffin is a British India slang term for lunching, and the lunch boxes themselves are called tiffins. Green Tiffin works on a flexible meal subscription plan and empty tiffins are returned via exchange at the next meal delivery, encouraging re-usability and eliminating trash from its operation. Green Tiffin's menu changes as the seasons do, fostering an alignment with the natural cycle of growth and availability. With over 100 menu items featuring cuisines from around the world, it caters to San Franciscans’ diverse palates, while striving to use local and organic ingredients whenever possible. Green Tiffin meals start at $10 with a $2 flat delivery fee and no charge for pick-up delivery. All meals come with appetizer and entree, and the occasional surprise dessert. Weekly menus can also be previewed on the website. In light of constant dismal fast food industry news and rising customer demands for transparency, Green Tiffin’s innovative approach highlights its belief in food becoming medicine for us and the world through its dual commitment to nourishing ourselves while preserving the planet. For more information and meal subscription, go to https://www.greentiffin.com/. 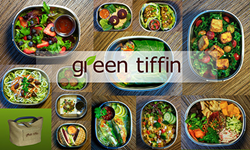 Founded in 2014 by Adrian Tay, Green Tiffin delivers tasty and healthy plant-based lunches in eco-friendly reusable tiffin boxes using electric bicycles in the streets of San Francisco.